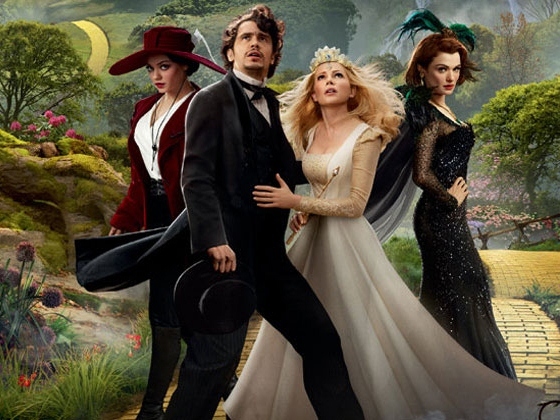 Years in planning, with blockbuster expectations (an $85 million opening weekend is projected) — even if they didn’t match the masterpiece that the original film was, Disney’s “Oz, the Great and Powerful” is sharping up as the year’s first “BIG” film. But even as the dollars add up, this $200 million production has a whiff of “What might have been” about it, succeed or fail. James Franco eventually got the job Depp was offered and Downey actually had. For a bit. Following the movie industry trades, you could watch as Sam Raimi grabbed this project and wouldn’t let go after his “Spider-Man” dreams were dismissed. The longer the planning went on, the more the cast changed. The film was delayed many times, and with Disney involved — you can be sure budget issues had them sweating bullets for the entire time. Might that have killed any dreams of a dream cast? Olivia Wilde, Amy Adams, Kate Beckinsale, Blake Lively, Keira Knightley and Rebecca Hall were considered possible witches. Wilde, Knightley and Beckinsale, in particular, have a vamp quality that the characters desperately need. They cast Michelle Williams, Mila Kunis and Rachel Weisz. Any of them scare you? While “Don’t look back” is a motto worth living by, try not to think about those combinations when you watch the finished film. And try not to dream of what might have been. (Roger Moore’s review of “Oz” is here). Oh man, I wish I hadn’t read this. I hear the cast is one of the worst parts of the movie. Fingers still crossed that it’s at least a decent movie. As a fan of James Franco, Mila Kunis, and Rachel Weisz, I am greatly looking forward to this movie. I’m more into what is than what might have been. Over exposed isn’t necessarily better! This review nails it. I wish that Franco could have channeled Frank Morgan, and poor Mila Kunis was much too doe-eyed to be believable. Still, I put on my emerald green glasses and enjoyed the story and special effects anyway. Too bad, it could have been a classic.